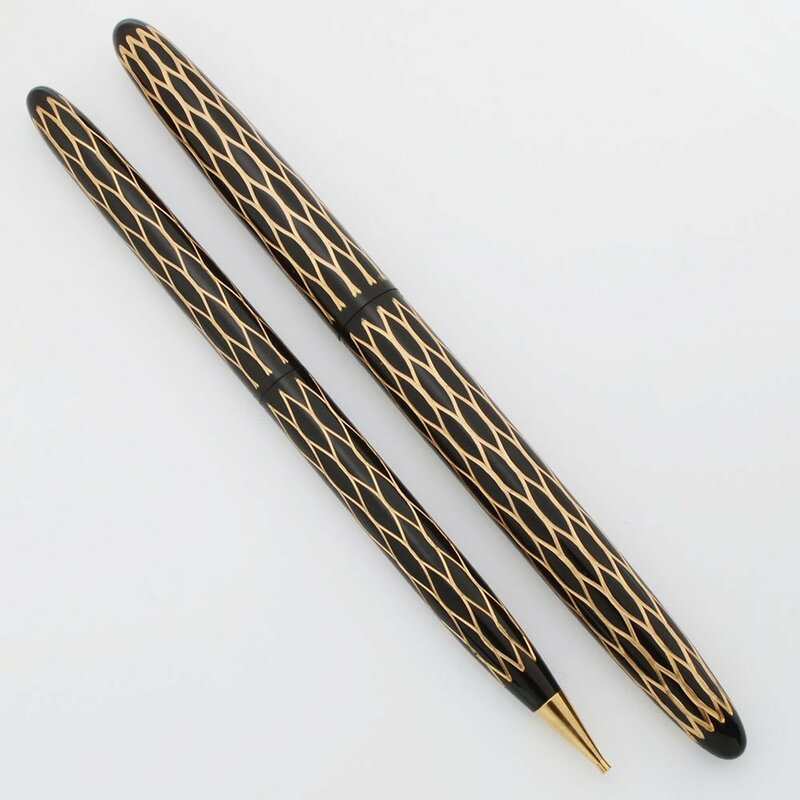 Lady Sheaffer XI (1959) fountain pen and pencil set from the Skripsert line. Black body with gold detail. Extra Fine steel nib. Excellent condition, in Lady Sheaffer box. Filling System This comes with a hard to find Sheaffer Skrip "accordian style" converter. It also takes Sheaffer style cartridges. The filling system is guaranteed to work. The pencil works perfectly and take .9mm leads. 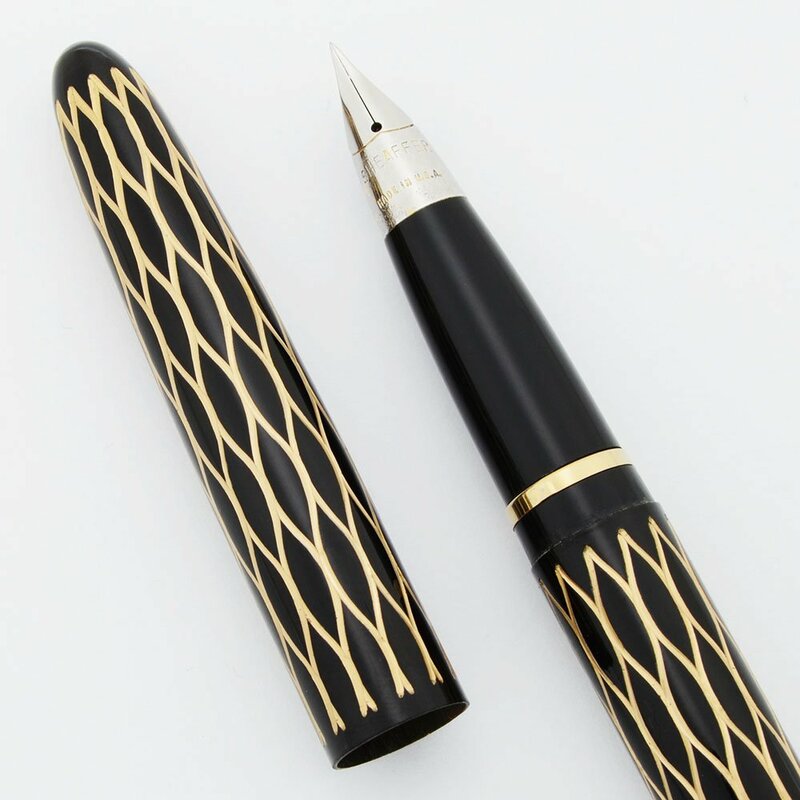 Color The body is black enamel over metal, with the detail in gold. I've heard this "Tulle" pattern described as crushed chicken wire. Nib EXTRA FINE Steel Triumph nib. Condition Excellent condition. There are a few light scratch marks on the cap and barrel on the black lacquer inside the chicken wire. The cap on the pen has some marks at the bottom end where it meets the barrel. The metal on the nib is rough, and though it writes well and smoothly, it's possible to see remnants of the gold masking that has flaked off. The section has moderate scratching with heavier scratching where the cap fits on it. The pencil has lacquer wear and light to moderate scratching throughout. There is heavier wear around the mid-section where the cap and barrel fit together and toward the top of the chicken wire near the cone. No cracks, chips, dents, or dings. In Lady Sheaffer box, which has some rust stains on the outside.